TGIF. The weather is so nasty outside here where I live. Everything is covered with ice. 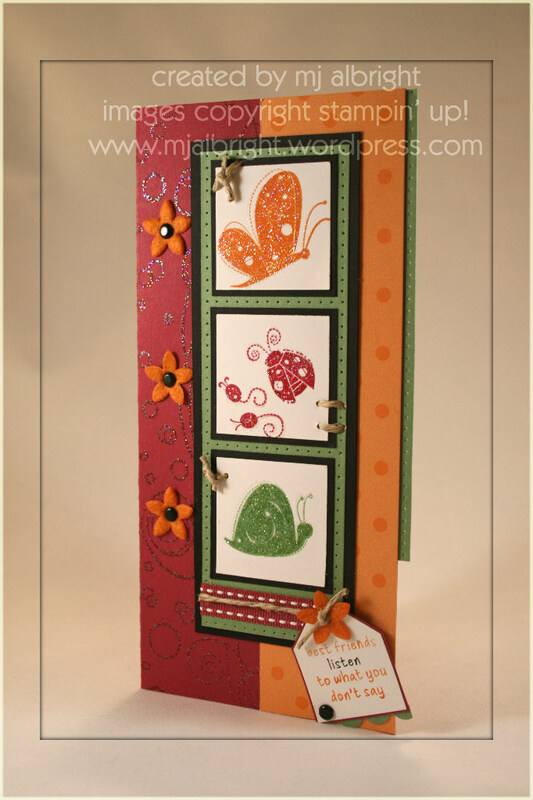 How about a card welcoming spring. Again, I’m playing around with the image/file sizes (I hope it worked again this time, but a tad smaller). Stay tuned for Part 2 with will feature a sour cream containter. 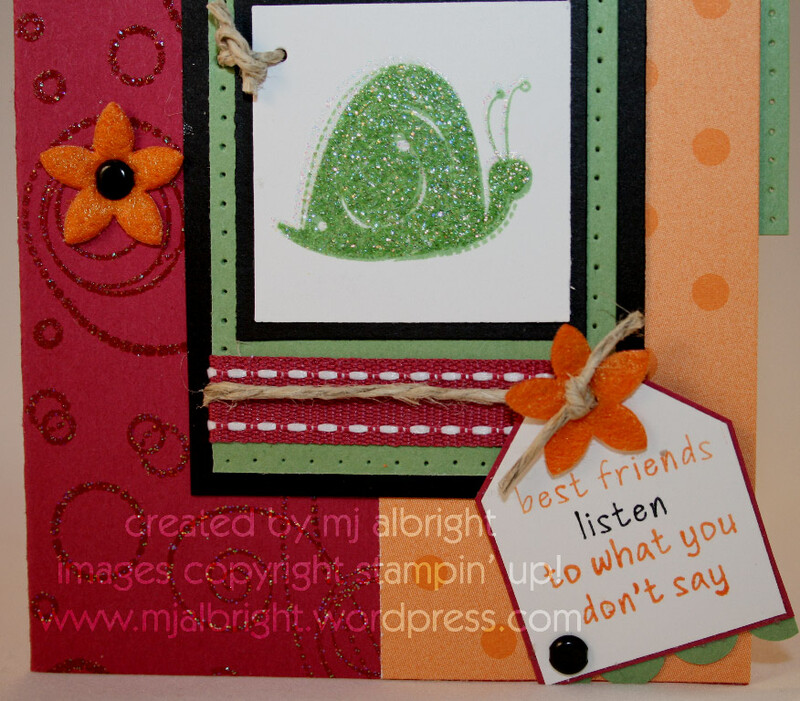 CARDSTOCK USED: Purely Pomegranate, Whisper White, Wild Wasabi, Basic Black, and Pumpkin Pie Prints DSP. INKS USED: Purely Pomegranate, Wild Wasabi, Pumpkin Pie, Versamark. Pumpkin Pie and Basic Black Stampin’ Write Markers for sentiment. ACCESSORIES USED: black brads from Vintage Brads Assortment, Flower Fusion, Hemp Twine, Purely Pomegranate Dbl-Stitched Ribbon, Scallop Punch, Crafters’ Tool Kit (paper piercing tool and template), 1-3/8″ Square Punch, 1/16″ Circle Punch, Small Tag Punch (punched to make it smaller within the punch itself), Iridescent Ice Powder. Oh how darling! Love this…the colors are so fun! Great job with the sketch! OH I LOVE this! So sparkly and just plain beautiful! Great card, Mary Jo! This card is awesome !! I love how you used the colors and the sparkling !! Oh my gosh – FUN colors, HAPPY images, and you’ve just rocked the layout. . . I love all the sparkle! This is just gorgeous! Love the bright and cheerful colors. Beautiful! I love that color combo. The black really makes the other colors pops! WOW! Love the colors! So bright and cheerful!! YOU ROCK!! So cute! I love the sparkly critters and the happy colors. Definitely perfect for spring! The glitter, images and colors all work so well together. This is so nicely done. I love the Ice you used. What a nice touch. Gorgeous. love the sparkle and the cool way u used the layout! Wonderful card! GORGOUES!! Love the colors you chose! CAn’t wait for spring. This is so pretty and sparkly!! I really love the colors you’ve used as well!! Would you mind my asking what irridescent ice powder is?? and how you apply it? I love the look it gives your card! So pretty!